This net lease is designed for a branch bank leasing space in a retail storefront. No percentage rent is payable, but the minimum rent is adjusted periodically using the CPI. This Branch Bank Lease (“Lease”) is made as of _________________, by and between COMMERCIAL PROPERTY LANDLORD, INC., a __________________ corporation (“Landlord”), and AGREEABLE BANKING TENANT, INC., a _________________ corporation (“Tenant”). 2.01. 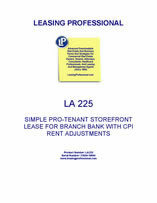 Tenant is leasing the Premises to operate and conduct a branch banking operation and related business. Tenant may not use the Premises or permit the Premises to be used for any other purpose. Landlord does not represent or warrant that Tenant's permitted business use is presently permitted or will be permitted in the future by applicable regulations.